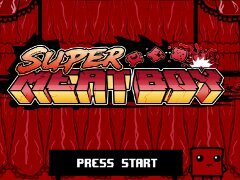 A few months ago I found out that Super Meat Boy was destined for XBLA. 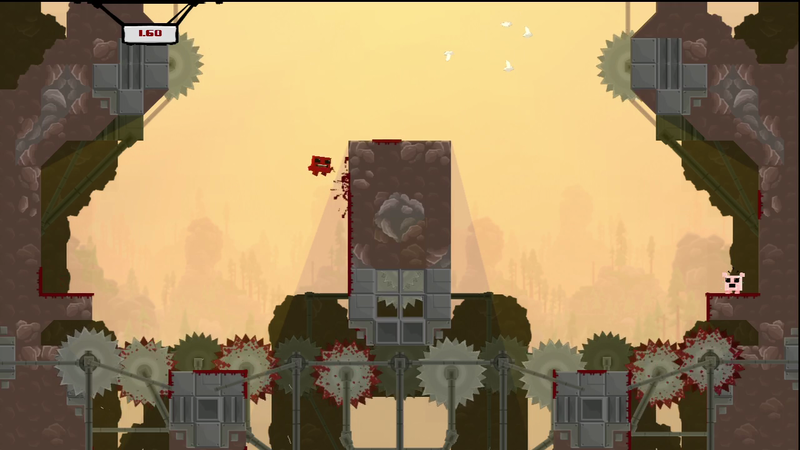 Now, I’d played through Meat Boy on newgrounds.com, and my rigid refusal to leave the game until I had beaten it led to me picking up a wireless XBox360 controller and so that I could have more precise control. 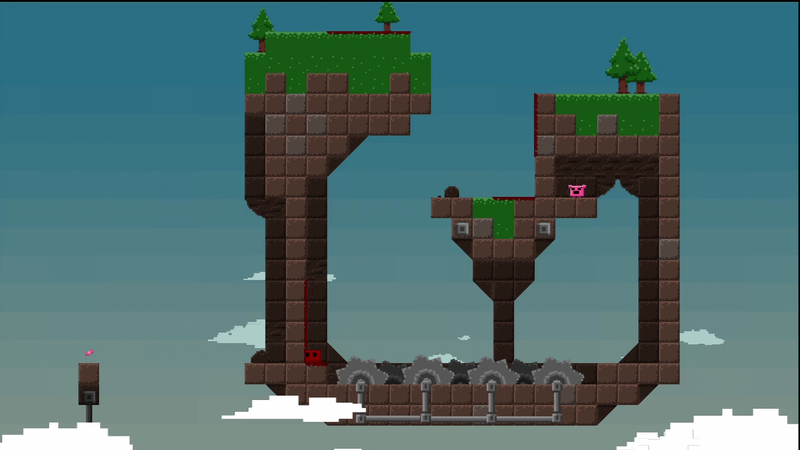 Now this precision platformer has finally landed on the console, via XBLA. Can it possibly capture the same flash game perfection it enjoyed in my browser? 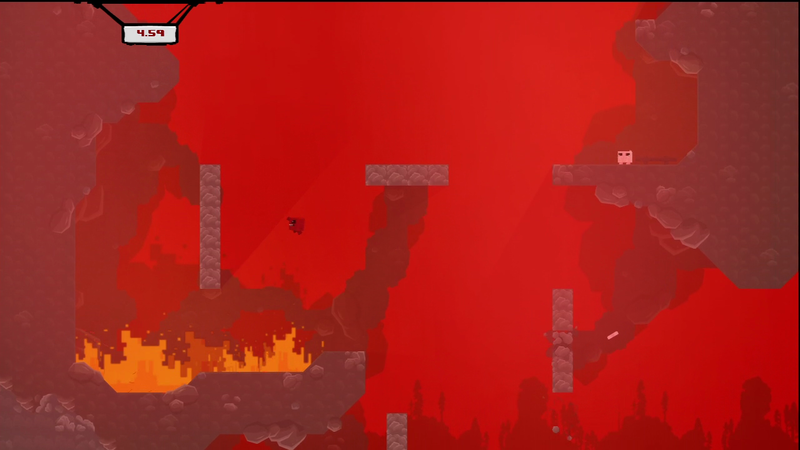 Super Meat Boy, at its core, is a heartfelt tribute to the games of our youth. 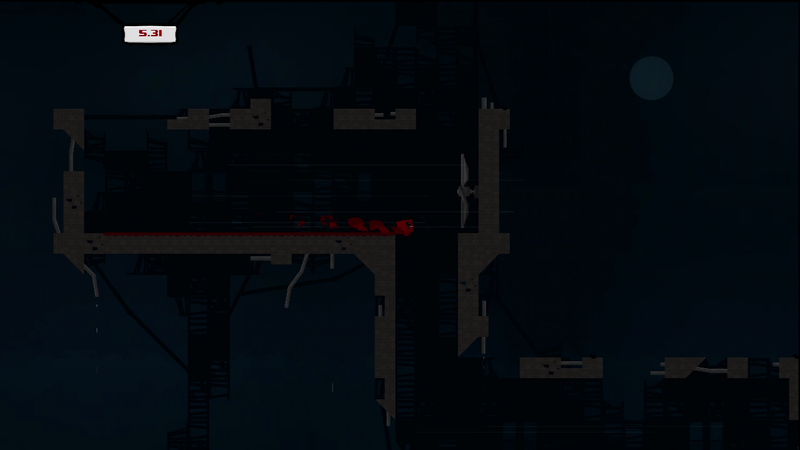 As such, its visuals are stylized 2D. 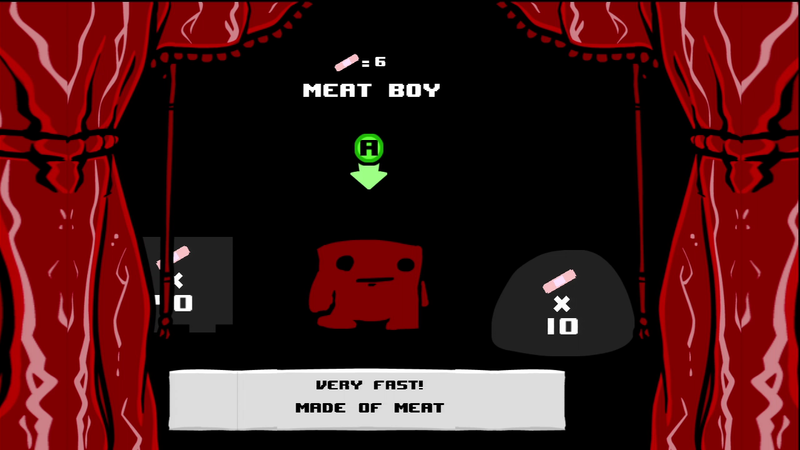 Meat Boy himself is little more than a square of red with arms, legs, eyes, and a mouth. Back in the flash game he was perhaps a dozen red pixels, but with the full force of the Xbox behind him, his lines have become a little more crisp and animated. (Well, usually, but we’ll go into the exceptions later.) Being nothing but a slab of meat, our hero leaves a glaze of juices everywhere he goes, from where he runs, to where he wall jumps and slides, to where he bumps the ceiling. The animation is surprisingly good, considering such a minimal character design, and quite detailed. When running and jumping, little sloppy strands of juice stretch between you and the surface for a few frames. 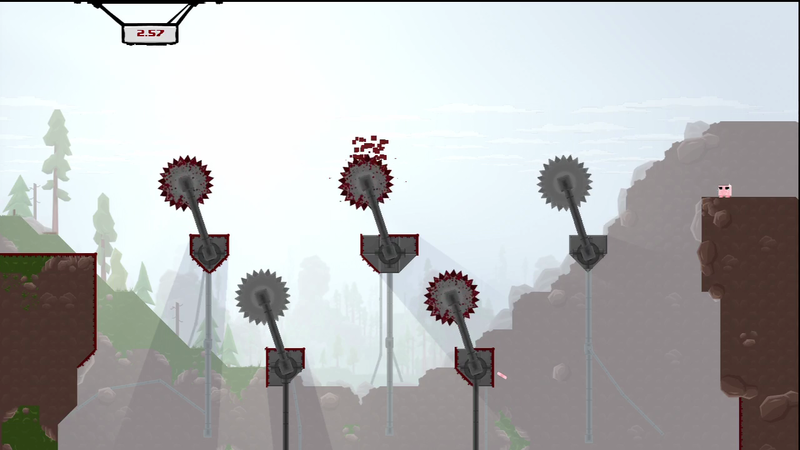 Meat Boy’s tiny face shows grim determination as he soars through the air, and when he hits a saw, the gibs fly. The levels are richly detailed and quite varied. They range from a forest, complete with scampering woodland creatures befalling the same pitfalls that you do, to a maggot infested post-rapture city. Not only that, but there are a few warps scattered about the game that shift you to an entirely different era of gaming, mimicking NES, Game Gear, Atari, Game Boy, and even GLITCHED NES. In those cases, your character’s pixel count drops to match the era he’s representing. One of the things I love most, though, is the cut scenes. 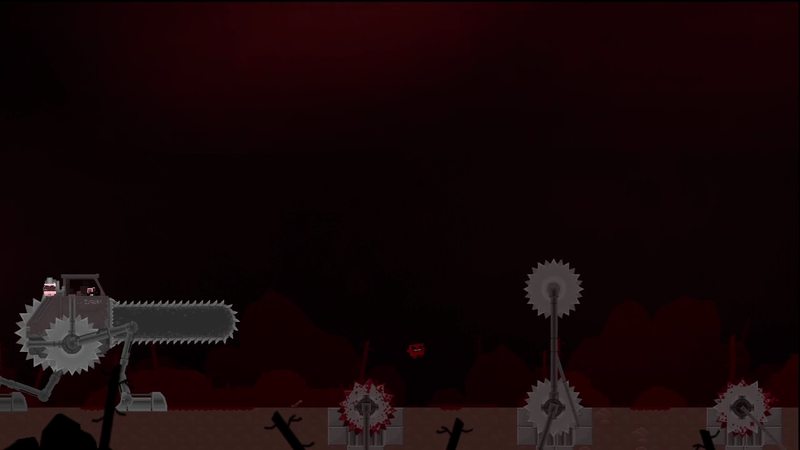 The beginning of every level, and the start and end of every boss fight, is accompanied by a flash-style animated cut scene. The level starts are made to pay homage to the opening of classic games. You’ll see references to Ninja Gaiden, Street Fighter II, and even Bubble Bobble. The boss bookends are in the style of the game, and show the crudely funny antics of the hero, the villain, and the bizarre side characters. I found myself putting in a few dozen more tries on a given level just because I knew that if I finally beat it, I’d get to see the next animation. Well done, all around. The gameplay is what would happen if you put all of the greatest platform games into a blender, strained the resulting puree, then distilled the juice. Either that or it is what happens when you take N+, tweak the physics, and apply some imaginative graphics. All you do is run, jump, and wall jump. Your little guy is very fast, and capable of screen-crossing leaps. Likewise, he is very maneuverable, reversing in air easily, and sticking to and sliding down walls. That is fortunate, because you will need every ounce of that agility and then some to navigate the devilish obstacle courses laid out for you by your fetal foe. 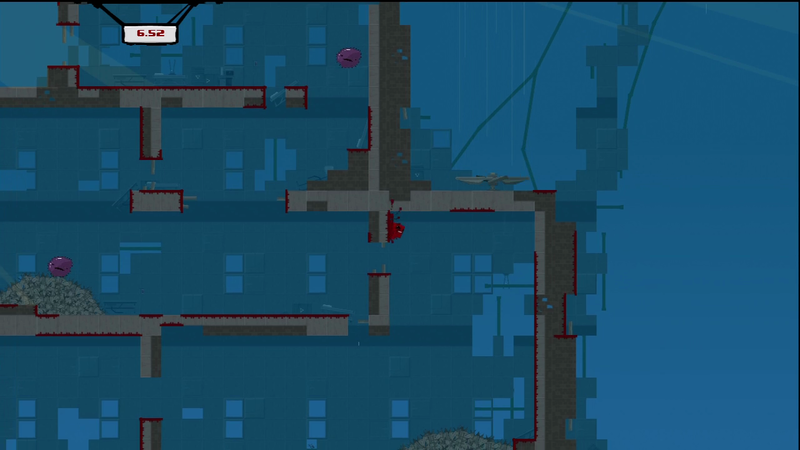 Super Meat Boy is hard, no doubt about it. The difficulty ramps from tutorial to “pull out your hair in frustration” almost immediately, and then keeps going. Every aspect of the run and jump, point A to point B genre is exploited from every angle, then they start throwing in monkey wrenches. Joining the standard bottomless pits and “touch it and die” sections of the board are wall crawling enemies, heat seeking missiles, twisted duplicates of yourself, multiple locks and keys, button activated platforms, fans, gravity shifts, and plenty more. 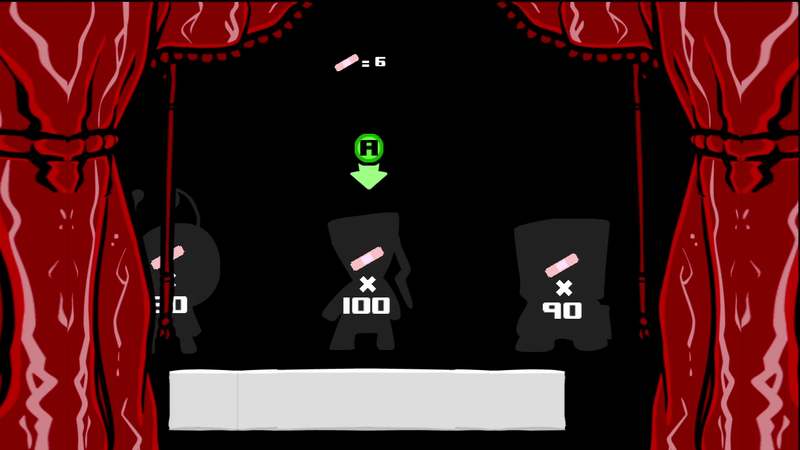 The controls are near perfect, and with a little practice you will be wielding your meaty hero with surgical precision, which will be JUST enough to cope with the challenges thrown at you. If, somehow, all of this becomes boring to you, there are still other things to keep you coming back. The obligatory leaderboard exists, of course, and likewise is the typical grading system. Beat the level quickly enough and you get an “A+” for the level. This isn’t just a pat on the back, though. 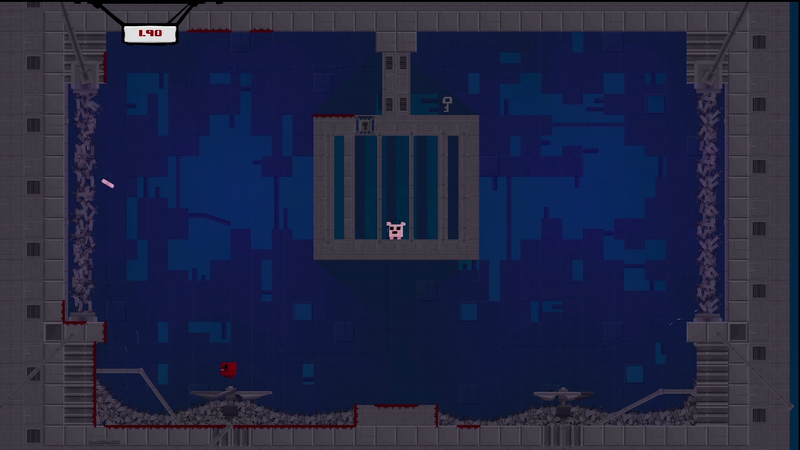 It enables you to play a “dark world” version of the same level. That’s right. There is two of every level, and that one you just couldn’t get past has an evil twin just waiting for you with more saws and fewer safe spots. Certain levels have a little pink bandage floating in a hard to reach area. Collect it and finish the level to increase your bandage count, moving a step closer to unlocking other characters, mostly cameos from other games. Rather than just a graphical swap, these characters each have their own unique abilities. Maybe they can hover briefly, maybe they can ceiling run and keep from sliding down the wall, or maybe they can double jump. These little changes help you reach more areas, beat levels faster, and generally have more fun. Some characters are unlocked via the aforementioned warps, while other warps exist simply to challenge you with the old school “limited number of lives” play style. Other little twists include the ability to save replays, and the fact that the game keeps track of every failed attempt on a given run at a board, replaying them simultaneously for you during the replay. It is just like that “many worlds mario” video that made the rounds a whle back, and it is actually fascinating to watch. I’m frankly astounded how much gameplay that they were able to wring out of such a fundamental concept. Oh, and one level is called “Teh Internets” which seems to be a repository for downloadable levels, so it is quite possible that this game literally DOES have unlimited gameplay. I never seem to have much to say about sound, and that hasn’t changed here. The music and announcements are spot on for evoking video game nostalgia, and also I love the wet slaps and juicy pitter-patter of running feet as the characters move. Every bit a match for the rest of the game’s presentation. Fitting for a title that is the refined fundamentals of platforming, the story is as hilariously elemental as they come, but with the same oddball twist as every other part of the game. You, the hero, are trying to rescue your girlfriend from an evil villain. It just so happens, though, that you are a hunk of raw meat, you girlfriend is a bundle of band-aids, and the villain is a fetus, in a jar. Oh, and the jar is wearing a tux, a top hat, and a monocle. I don’t think I need to go any further than that. It sort of speaks for itself. I love this game. It is marvelously challenging, endlessly innovative, and every crevice is filled with tasty little extras. The only two complaints I have are matters of taste. In terms of difficulty, it may be a bit much for some people. I found myself teetering on the brink of frustration fairly often, and if it wasn’t for the excellent art style and sense of humor of the game, I might have been inclined to give up. Fortunately I stuck with it long enough to feel my mastery of the characters rise to the occasion. The other issue is that the humor might be a little bit rough for some. Bandage Girl gets roughed up an awful lot for a damsel in distress, for instance. I, for one, thought it was hilarious, but judging from the reactions some have given to the gags in comic jumper, I feel compelled to issue that warning. 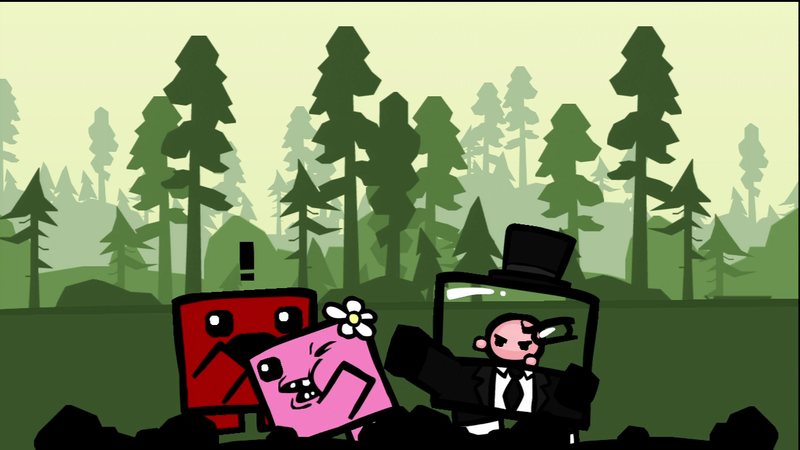 Otherwise, Super Meat Boy is as close to genre perfection as anything I’ve played. Bravo. 9.8 / 10. 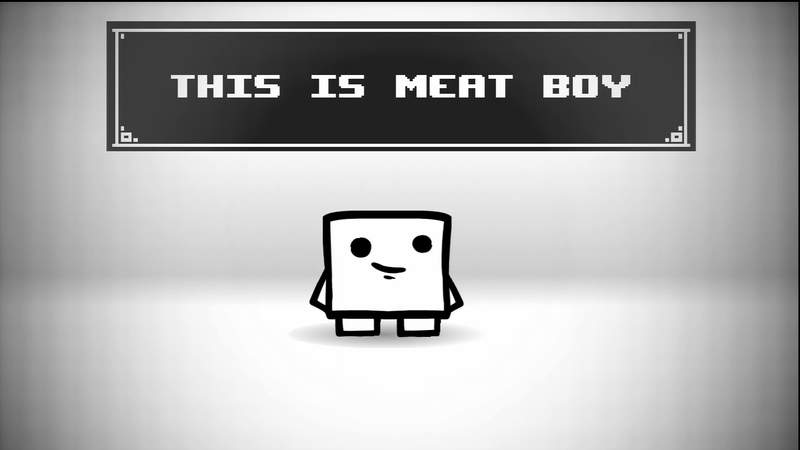 Super Meat Boy is the distilled essence of platform gaming.